In the spring of 1990 one of the most important workshops of Hungarian music history was opened in Budapest to Hungarian and foreign visitors. This is the only workshop that has basically remained in the condition as left by its immortal dweller, Zoltán Kodály. Visit is possible after setting up an appointment. Please contact us via phone or e-mail at least two days before your visit. 1062 Budapest, Andrássy út 87-89. 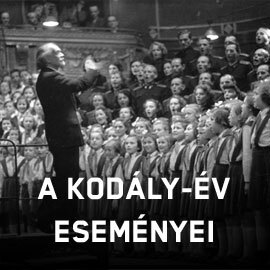 From October 1924 till his death in March 1967 Kodály lived at the Körönd, which is named after him today. Both the circus that the windows look on and the road with the entrance to the sector-shaped house have preserved numerous features of the historical waves sweeping across Hungary. When the Kodály family moved here, the road was named after Gyula Andrássy (as it is called now), the Prime Minister of the 1867 Constitutional Government. In 1949 the road was renamed to Stalin road, in 1956 to 'Road of the Hungarian Youth' and in 1957 it became the 'People's Republic Avenue'. During World War II the circus was named after Hitler. In 1982 its original name was replaced by 'Kodály Körönd'. This is a miniature Hungarian history in the light of street plates. The flat consisted of four front rooms with conveniences. The furnishing was practical rather than luxurious; its individuality and charm was given by the taste of its residents. The rooms were decorated with folk ceramics and embroideries (souvenirs from the folk song collecting trips), and with keepsakes of the long-lasting artistic career: statues, laurel wreaths, programs of prominent performances abroad, as well as pictures of the closest family members and contemporary colleagues. The dining room surprises the present day visitor with its puritan and simple furnishings; in Kodály's time, visitors entered this room just like the museum visitors today. We have to picture to ourselves the intellectual radiance of the hosts that made this row of rooms a home, a workshop and a safe resort, even in difficult times. At the dining table there was always a place for welcome guests, and visitors around five in the afternoon were offered mint tea and cakes. Kodály also received the less intimate visitors at this dining table, one time covered with wax-cloth. This is where his first wife, Emma and her helpers sorted the newspaper cuts and other documents of his career. After her death, Sarolta Péczely, Kodály's second wife continued this work in the same spirit. The collection compiled in this way served as a basis for the Kodály Archives, now arranged according to scientific principles; and for the subsequently connected Memorial Museum founded with the help of the Zoltán Kodály Pedagogical Institute of Music, Kecskemét. Welcome guests and musicians coming to rehearsals were taken to the next room - a parlor radiating the spirit of the 19th century, worth being painted by Munkácsy. This place was dominated by two pianos. From above the door a Beethoven mask looked at the visitors. Around the stove the sculpture portraits made in various periods by Petri Lajos lived together with their much vivid, not at all statue-like model. Imre Palló, Mária Basilides, Endre Rösler, Set Svanholm, János Ferencsik and Erzsi Török had rehearsals here; the young Tamás Vásáry and the infant prodigy, Miklós Perényi played here Kodály-works to Kodály himself. Valuable photos kept the memory of Yehudi Menuhin, Aram Khachaturian, József Szigeti, Pablo Casals and Leopold Stokowski who visited this room in the last years. The innermost room was the real workshops with its carved desk and a library covering two walls. Beside the fundamental literature on music history, ethnography, literary history and Hungarology, there were also masterpieces of fiction and poetry in Hungarian, German, French, English, Italian, Latin and Greek languages. Kodály's violoncello - once in frequent use - was kept on the top of the cupboard, with a splinter-hit 'wound' on its body reminder of World War II. The past and the present of the folk music researcher were evoked here and there by several folk instruments and sound recordersing devices. The desk, the tables and the chairs were covered with letters and documents: the tools, requisites and intellectual scobs of an animated workshop. The former bedroom, opening on the left of the dining-room, serves as a place for temporary exhibitions of the Museum. The first such exhibition gives a rich insight into the composer's workshop, showing for the most part the materials of the Kodály Archives. Through selected documents it presents the years of preparation, the major works of certain periods, the masterpieces of various artistic forms and sometimes the birth process of the works, even from the very conception. It is also indicated how folk song research helped the composer, and how the composer directed his own imagination towards the creation of the 'Singing Hungary' idea. The visitors can see the manuscripts of popular masterpieces, never-performed compositions, some of the first and last works, hastily jotted down notions, as well as final copies of mature works. In one word, you can find here many things that are created and issued in a workshop along with those remaining unissued experiments. The Kodály Archives is an independent establishment but also a co-existing institution of the Museum which runs under the same roof. Its primary task is to properly collect, preserve and register Kodály-documents (manuscripts, printed scores, photos, sound recordings and motion pictures). Other purposes of the Archives is to promote and introduce Kodály-research. The intellectual direction has been undertaken by Mrs. Zoltán Kodály nee Sarolta Péczely. The material of the first temporary exhibition of the Museum came mainly from the Archives, thus calling the attention of the public and the researchers to this newly established institution. May the Whole World Rejoice!